The last leg of my late autumn Himachal misadventure took me to Parashar Lake (or Prashar Lake as pronounced by the locals). It was not a very satisfactory experience. So, I will not spend too much time describing it. Not that it was totally disappointing but it was just not the right time. I have seen lush green monsoon images of the lake. I have also seen winter images covered in snow. But this early November trip had none of those to offer. The dry grassland was made even more unappealing by unfavourable weather conditions. Hazy and characterless sky and weak light killed most of my photographs. Anyways, I still recommend the place, but at a different season of the year. 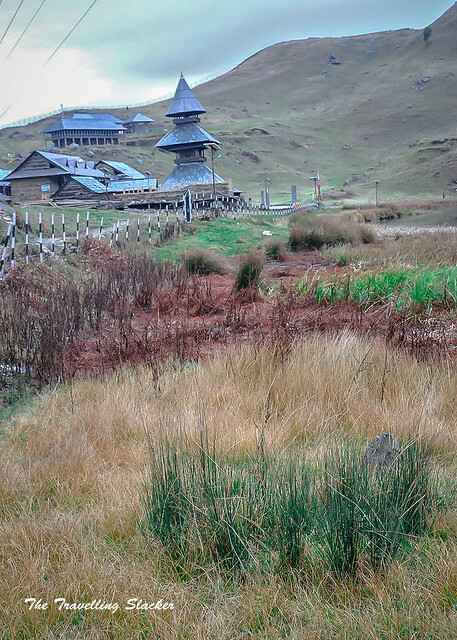 Parashar Lake is around 49 kms from Mandi, which is a reasonably big town well connected with the plains. Mandi is one of the major stops on the highway that eventually connects the plains to Manali. But the problem here is that the lake does not exactly fall in any of the regular routes and so there is no public transport available and you have to pay extra and hire a private vehicle. I asked the hotel manager to get someone and a local guy with a Maruti Alto was arranged. We started at around 9 am in the morning. 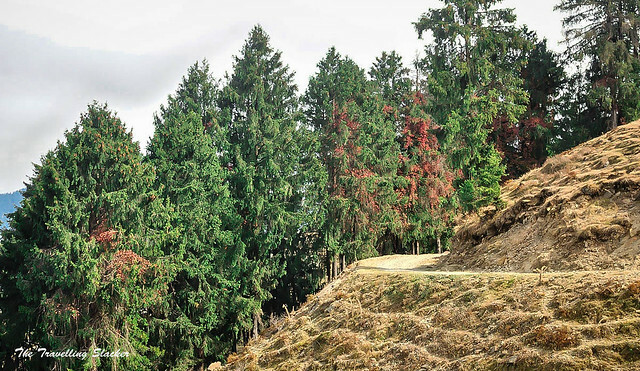 The first half is easy as it goes through an older and shorter route leading to Kullu (Not the highway). But after some time it takes a diversion and the rest of the road is narrow, not so well maintained and was also broken at a couple of points. As a result it made the progress extremely slow. We stopped once to have tea at a roadside shop and finally reached the top after 4 hours. The lake in itself is a unique sight with a distinctive floating island, even though the weather had played spoilsport. The reddish autumn hue of the grass made me feel a bit morose. The temple dedicated to Sage Parashara is situated by the side of the lake. There are smaller adjacent settlements and some eateries too. 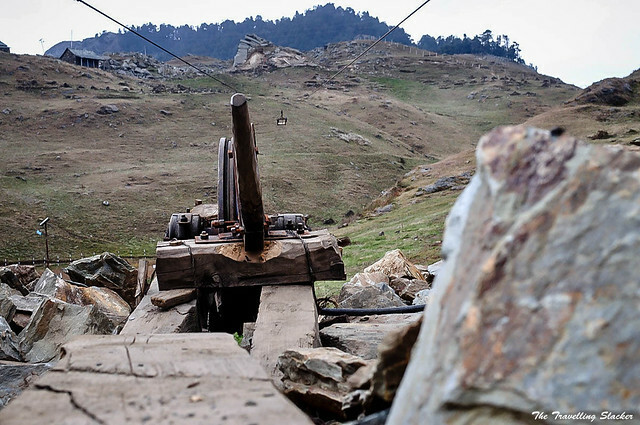 A basic but innovative “ropeway” is used to transfer goods from nearby points. The temple is an active and functioning one complete with a priest and a noticeboard asking people to remove shoes before entering the precinct. There is a statue of the sage inside the temple but I wasn’t sure it is actually dedicated to the Vedic sage or was it someone else. The current temple was apparently built in the 13th century. The descent was marginally faster but got a couple of better views as the sun finally turned up. I still think I choose the timing wrongly. Nevertheless, next year I will be back in the region with much more ambitious plans. 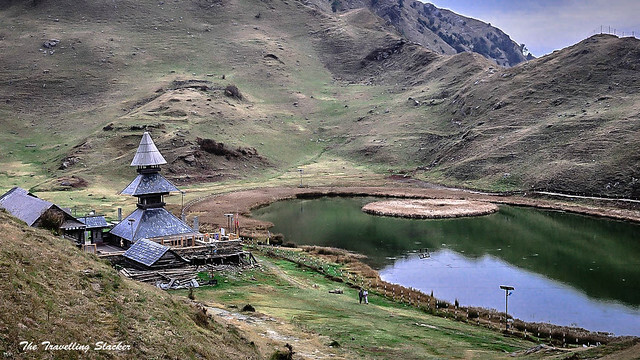 How to Reach Prashar Lake? First you have to reach Mandi which is around 430 Kms from Delhi en route to Kullu and Manali. 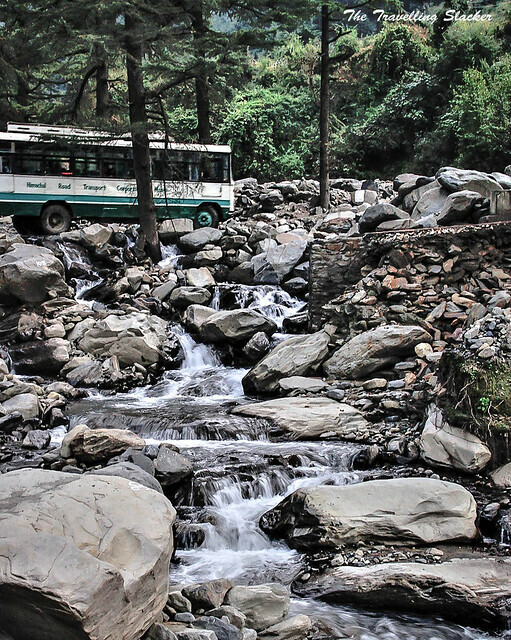 You can take any Manali bound bus and get down at Mandi. Otherwise you can take a train to Chandigarh and then a bus from there. 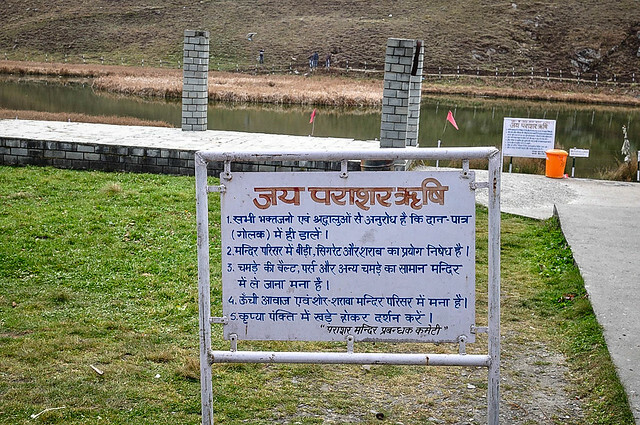 You can hire a private vehicle to visit the Parashar Lake and come back. They normally charge between INR 1500-2000 for this. 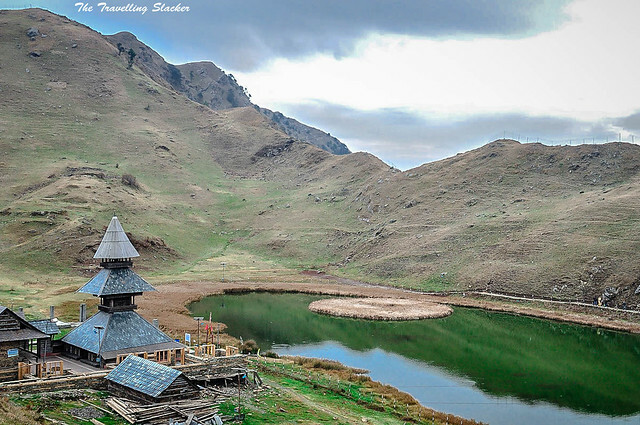 What is the best time to visit Parashar Lake? You can visit in the winters if you like it to be snow clad. But in the monsoons it looks more vibrant and as colorful flowers dot the green hills. Autumn seemed a bit off to me. 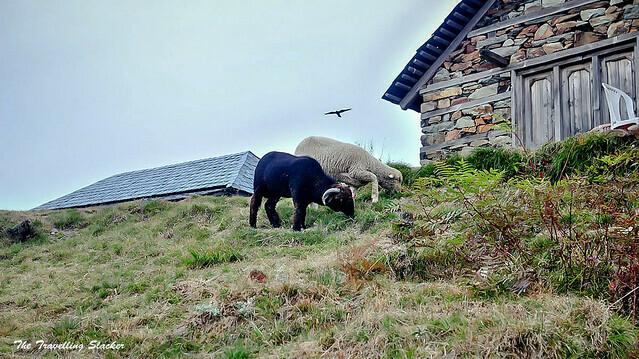 What to see near Prashar Lake and Mandi? 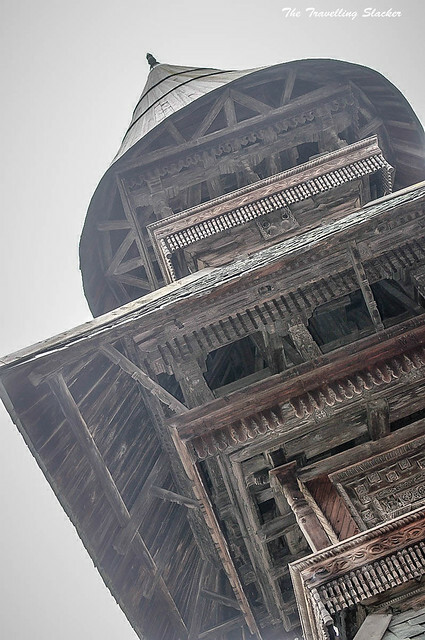 Apart from Parashar, Mandi itself is a nice little place with several old temples. You can visit Barot etc or move towards Aut to explore regions near the GHNP. Otherwise you can get buses to Karsog and explore Chindi, Shikari Devi, Kamru Nag etc. Some of these involve treks and so avid high monsoon to be on the safer side. We went there in 2007 and loved it. We stayed at the forest department guest house, My nephew stayed at the temple dharamshala! Thanks for bringing back the memories. Wow…what a gorgeous place! Thanks for sharing! Himachal is incredible! 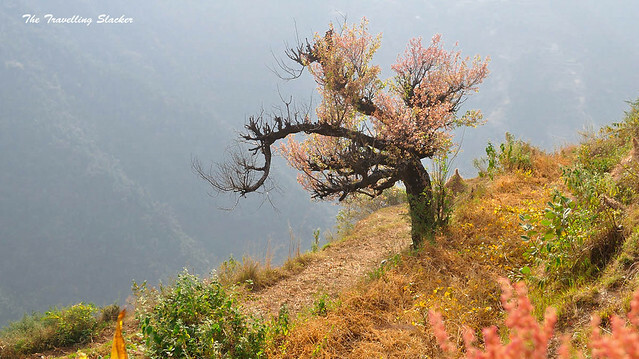 No doubt, himachal is such a wonderful place to spend some time in like haven. It still look appealing, compared to all the lakes disfigured by so called development. Thanks for sharing.Lovely photographs. Great photographs! I’m thinking of visiting the place later this month. Looks really far from the crowds. Hi , u mentions 4 hours drive , from Mandi 4 hours to parashar lake ? U said only 45 Km , right ? 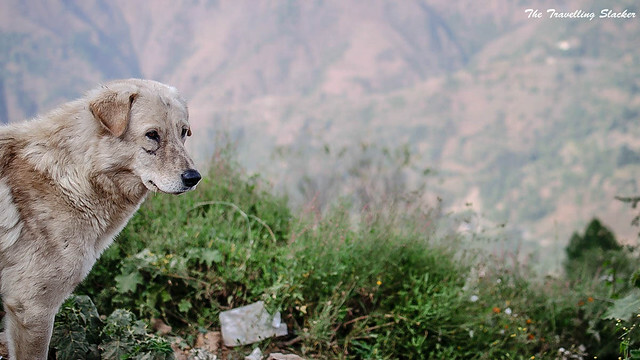 Yes… are you not familiar with the Himalayan roads? Seems to be a nice weekend get away.planning to visit shortly from Chandigarh. Nice article Jitaditya. I’m planning to go there on the mind weekend of 24th March. Have you been there around that time, any clue if there would be snow? Also quickly wanted to know, if we come from Delhi, and take a bus to Kullu, do we get off at Mandi? Or easier to go up Baggi from Kullu? I take it treks start from Baggi? We’re planning to reach Mandi, Kullu by 25th Morning 5-6 AM. It is possible as far as I know. Although I have not done it myself. 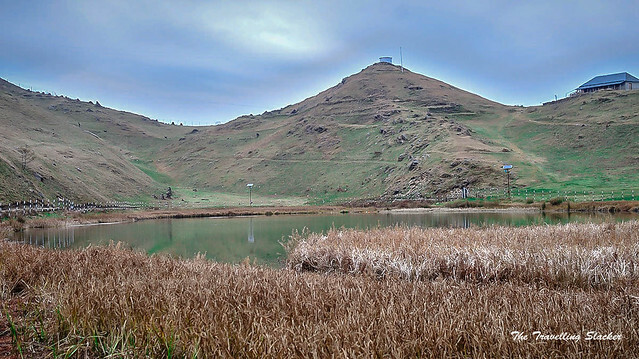 I am planning to on 9 10 April next month to Prashar lake. Kindly guide me if this time is good to go there. I’m planning to trek to Prashar end of this month. Can you please let me know if I can carry my own tent and camp there? Or, if I need to make any advance booking in order to camp my own tent? Yes people do that. Not sure about permissions. I think you can just go and peg your tent. But do ask some locals to be on the safer side. Is there any overnight stay arrangement at parashar? Well written and informative article. I would like to visit the place in near future. Just visited yesterday…..Awesome Awesome Awesome….although this was not the best season to visit…but still amazing place and experience….locals are very helpful…..Enjoyed a lot. 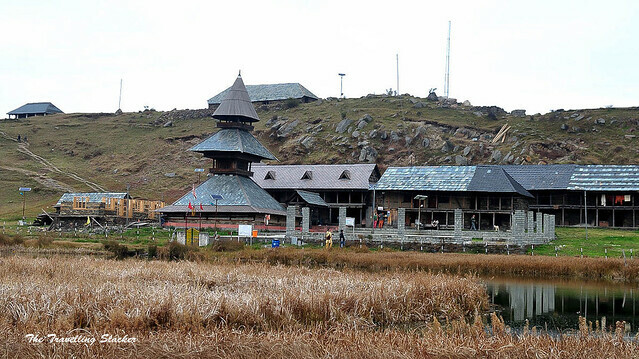 Can one stay in a temple at prashar lake? I thnk it is possible thought cannot say for sure. Otherwise there are a few govt guesthouses nearby. I went in November 2014 and had a lovely time! Excellent article with excellent pictures . Awsm post with everything well explained – just want to know if i want to visit during 31st Dec from Delhi – will stay will be available there. I am planning for this trek with one of my frnd and hope so there is safe for her also. Please help me about the stay – I need to travel from Delhi and planning by bus only. Whar are the accommodation options there?? Please advice me any camping person contact number for advances booking planing to go in Apr’17 last week. 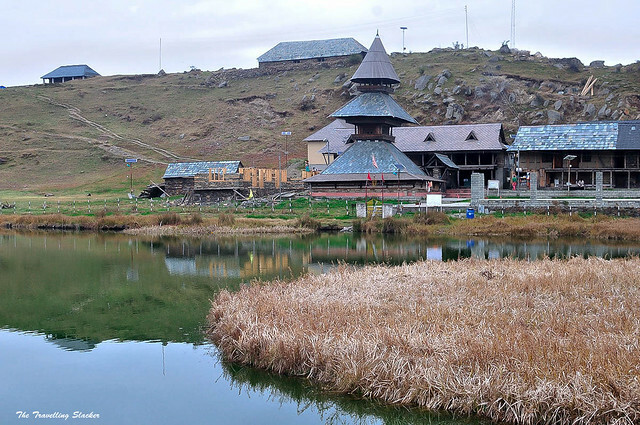 Hi, actually we were planning to visit Parashar Lake this month and we were hoping we could spend the night there, but I couldn’t find any hotels near the area. Do you know of someplace near the lake where we can crash for the night?